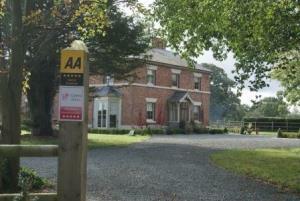 Willington Lodge Guest AccommodationWillington Lodge is a luxurious smallholding nestling in a superb location on the Welsh/Cheshire/Shropshire borders, very accessible off the A525, set within large grounds. It is closely situated to Iscoed Park, which is a very popular wedding venue, Bangor on Dee Races, both 5 miles away, Erddig Hall, Aqueduct at Trevor, superb restaurants in the locality, many fabulous bridal paths and cross country courses, if you should wish to bring along your own horse. Superb for tranquil walks in the beautiful countryside, very quiet. Located within 12 miles of the Aqueduct, which is a World Heritage Site. -	A Welcome Tray offering a selection of teas, coffee, water and other goodies. -	Luxurious pure down duvets and pillows. -	TV and Internet Access, Ipod docking station. Each room has been individually designed to make your stay welcoming and luxurious, whether you are here for business or leisure, visiting friends and family in the neighborhood, attending weddings in the locality, golfing, horse racing. Everyone welcome… Our . The Groom's Suite has a King Size bed with luxury down duvets and pillows to ensure a good night's sleep. A fridge is provided for your use during your stay with complimentary fresh milk and water. A welcome tray with coffee, both ground and instant, a selection of teas, shortbread biscuits, fruit, cakes on arrival. The furnishings are in a French style, with carefully chosen accessories to coordinate with the decor. The En Suite has a large Jacuzzi bath, power shower, double wash hand basins, fluffy towels and bath robes for your use. There are an additional 2 single rooms off the main bedroom which are perfect for children. The Groom's suite offers very spacious accommodation for a couple or would be ideally suited for a family of 2 adults and 2 children. . A camp bed is available on request for a 5th person. This is a double room with a duplex arrangement overlooking the Walled Garden. The bedroom is downstairs and there is an attractive Victoria staircase leading up to the spacious bathroom. French door leading onto private terrace within the walled garden. The bathroom suite consists of double sinks, slipper bath overlooking the grounds, separate rain shower, toilet. tea and coffee making facilities, freshly baked cake on arrival, bath robes for your use during your stay, molton brown toiletries, iron and ironing board, work station, complimentary Wi Fi. The Gamekeeper's Suite - This is situated in the Courtyard and is on the ground floor and is made up of three rooms. The main bedroom has a large king size Victorian style bed, luxurious bedding. The lobby area leading from the main bedroom has tea and coffee making facilities, freshly baked cake on arrival, iron and ironing board, hairdryer, bath robes for your use during your stay. The bathroom leads from the lobby and has the original cast iron bath from the main house which has been refurbished, separate rain shower, towel rail, vanity unit housing sink storage space below and toilet. Molton Brown toiletries for your use. Complimentary Wi Fi. This suite has it's own access onto the courtyard at the front and terrace at the rear. Very private area for sunbathing, ideal to store bikes and perfect for pets. Parking is outside. Corporate packages for 2 and 4 nights are available mid week. Breakfast is served in the dining room on a stunning round antique dining table, French style with coordinating furnishings. A very elegant room to start your day overlooking the grounds and courtyard, roaring fires in the winter. The Drawing Room is available for use during your stay and is tastefully decorated to give an elegant, tranquil ambience with roaring open log fires, a selection of current magazines. Breakfast Served between 8.30 a.m. and 10 a.m.
Willington Lodge is a luxurious smallholding nestling in a superb location on the Welsh/Cheshire/Shropshire borders, very accessible off the A525, set within large grounds. It is closely situated to Iscoed Park, which is a very popular wedding venue, Bangor on Dee Races, both 5 miles away, Erddig Hall, Aqueduct at Trevor, superb restaurants in the locality, many fabulous bridal paths and cross country courses, if you should wish to bring along your own horse. Superb for tranquil walks in the beautiful countryside, very quiet. Visitors have the use of an elegant drawing room to relax in the evenings Children welcome from any age. Willington Lodge is a luxurious smallholding nestling in a superb location on the Welsh/Cheshire/Shropshire borders, very accessable off the A525, set withing large gardens. It is closely situated to Iscoed Park, which is a very popular wedding venue, Bangor on Dee Races, both 5 miles away, superb restaurants in the locality, many fabulous bridal paths and cross country courses, if you should wish to bring along your own horse. Superb for tranquil walks in the beautiful countryside, very quiet.